The Northeast is experiencing a few days of intense heat and humidity, technically it isn’t called a heat wave until a certain number of days of at least 90 degrees pass, if tomorrow registers 90 then it will be official, New York has its first heat wave. 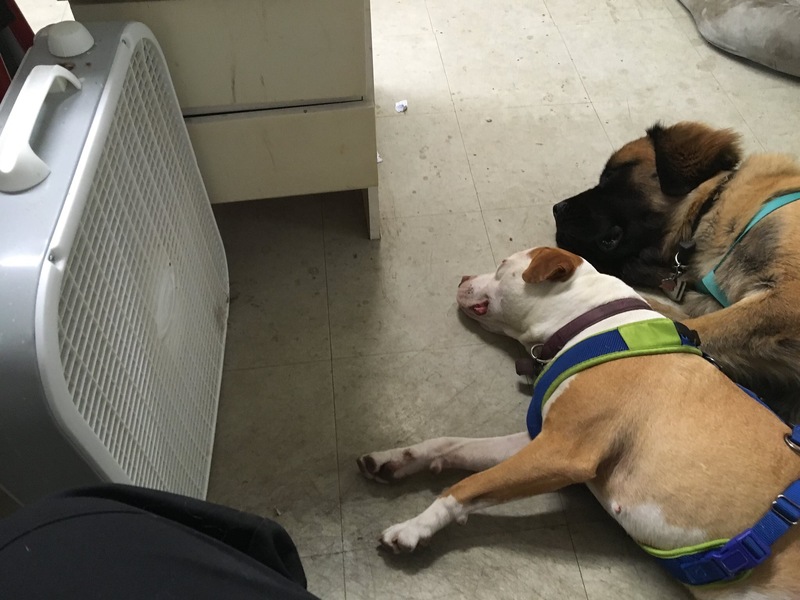 We weren’t the only ones suffering from the heat, the dogs were pretty pooped by the heat, thank goodness my mother not only had an oscillating fan that we aimed at the dogs, but also a box fan that we positioned opposite the oscillating fan to create a cross breeze. It worked pretty well, after every walk, the minute we entered the house, the tired dog would search for the fan and plunk himself or herself in front of it. The heat got to my mother and myself, ordinarily we enjoy going into the city to walk from neighborhood to neighborhood, but with temperatures in the 90’s we kept our walking to a minimum, ducking into stores to take advantage of the air conditioning so we could cool off. That was on Wednesday, the other days we stayed at home in the cool, at least I had the cool to come back to after the numerous walks I took the dogs on, I wasn’t able to walk them as a group so I walked them individually, I walked a lot. Congratulations sweetie on the new job, I hope you don’t suffer too much from the heat.